The reporter Edgar Snow is well known both in China and in the west for his early reporting on Chinese communist and especially his book Red Star Over China. When he died in 1972, part of his ashes were buried in China, by the picturesque Unnamed Lake on the campus of Peking University, where he had taught journalism during the 1930s. His tombstone was inscribed with "In Memory of Edgar Snow, an American Friend of the Chinese People," calligraphed by Marshal Ye Jianying. Snow's widow, Louis Wheeler Snow, had been a state guest of the Chinese government for many years until 1989 when she was so upset with the Tiananmen Massacre that she refused to visit China as a guest of the government. It was not until 2000 when the seventy-nine years old Mrs. Snow visited China on a personal tourist visa. She sought to meet Tiananmen Mothers. A meeting with Professor Ding Zilin was foiled by the government. Yet Mrs. Snow managed to meet another member of that organization, who was later detained by the police. Mrs. Snow had not been back to China since. 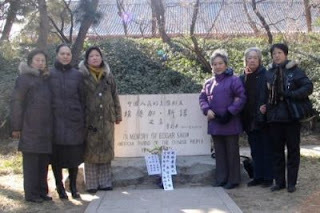 With shared sympathy, the Tiananmen Mothers took up the task of visiting Edgar Snow's grave on her behalf on February 15, anniversary of Snow's death, each year. They are forbidden to use the "Tiananmen Mothers" label on the wreath they place at the grave so they use their real names. They reported that they are the only people who visit Snow's grave regularly through the years. It appears that the grave site has been ignored and fallen into disrepair by both the authority and the public. It falls on them to clean up the site on each of their visits.